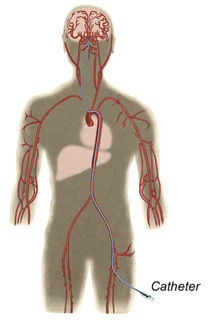 The University of Florida offers highly specialized treatment for AVM. Approximately 100 patients with AVM are seen each year at the University of Florida. 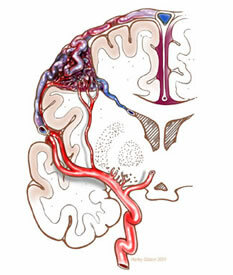 Brain arteriovenous malformation (AVM) is an abnormal tangle of blood vessels in the brain which can cause bleeding in the brain, seizures, or stroke-like symptoms (weakness, numbness, tingling). The cause of AVMs is unknown. 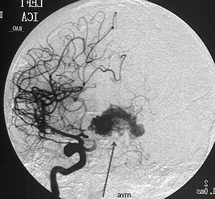 The treatment of a brain AVM is either by surgery (opening the skull and surgically removing the AVM from the brain ), embolization (injecting substances into the AVM to block off the abnormal vessels via tiny plastic tubes inserted in the patient’s groin and navigated to the brain by x-ray guidance and not requiring surgery), or radiosurgery (a one-time treatment of high-focused radiation to the brain AVM). Many times these treatments are combined.